Please refer to our stock # 1839 when inquiring. Title: Study of a Grey Tabby Kitty. This size starting $144 when accompanied by final larger piece. Medium:Acrylic using Made in USA Golden professional artist paints on 5"x7. Original work by this self learned painter who also paints oils, forges studio sterling silver metal work and has constructed fiber art to wear in the past, has been exhibited in various area fine art association shows since the 90s and at the previously open Methuen studio store gallery by the same name. 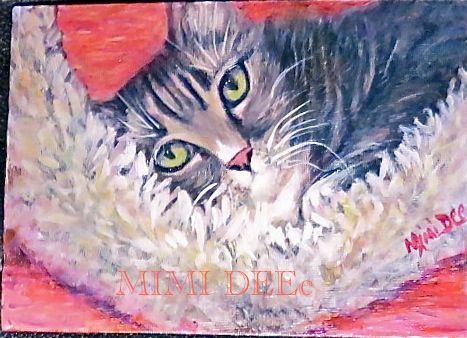 To view the finished larger work please search #: 1354045 here at www.mimideeartwear.com/catalog.